Esstentially the work is a compilation of Vimalaji’s letters written to the author who had the opportunity to live with her and witness the rhythm-mic, pure, meditative life dedicated for the well being of the nations. Vimalaji’s approach in dealing with the author-sadhaka is an education for all of us, in itself, indeed a practical education. An approach dealing with the particular mind-set of the aspirant but without the imposition of authority. The letters, here, are arranged chronologically and have been assigned fitting titles which are quite expressive of the contents, beneficial to every spiritual aspirant. 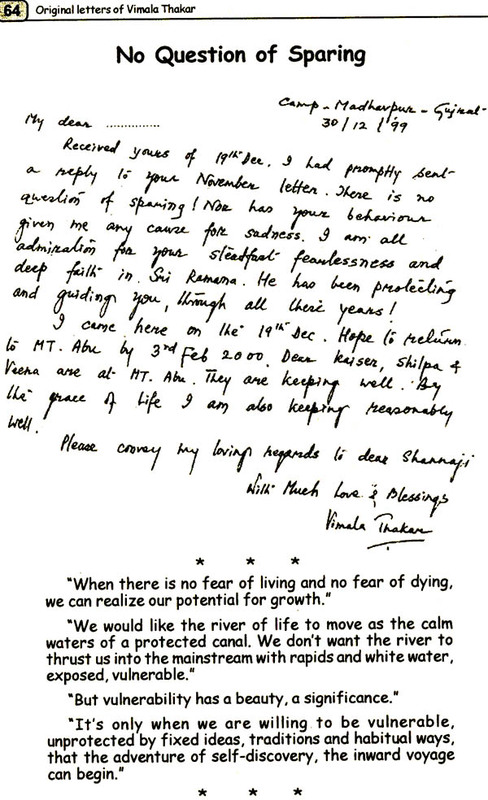 Most of the letters are in Vimalaji’s handwriting, giving it a feeling of closeness. They pierce the psyche of the readers, illumining our understanding and incisively and persuasively teach that the spiritual and eternal is to be prized above the material and transitory. Nithiya Kalyani is the daughter of late Sri Kula Sabanathan and late Smt. Annapoorani of Sri Lanka, a cultured Hindu family. Her father was well-known for his literary talents and cultural outlook having produced several valuable books on ancient Hindu temples of Sri -Lanka including Katharagama. Nithiya has been a rebel from her young days and has blazed a trail on the spiritual path outside the field of orthodoxy on her own during her adult life, in the midst of her active professional career in Sri Lanka and abroad as an Information Desk organizer and Journalist working for various institutions. Now in retirement, she is concentrated on the task of making available to the discerning public the valuable insights she has gained in the course of her spiritual endeavour with the guidance of Vimalaji, the Venerable Sage of Mt. Abu of Rajasthan, India. 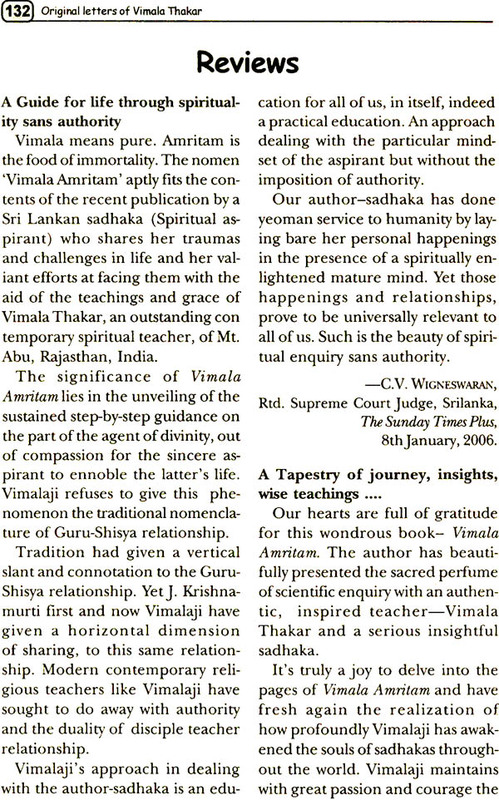 It is with great joy that I respond to the request to write a Foreword for that jewel of a book entitled ‘Vimala-Amritam’ (Vimala Nectar) containing valuable gems from the Teachings of Vimala Thakar of Mt. Abu, compiled by a sadhaka who had the rare opportunity, to have had the benefit of direct satsanga with an illumined sage such as Vimalaji for an appreciable length of time and also exchange of letters with her containing clarifications of deep spiritual truths. I had the privilege and good fortune to be able to arrange Vimalaji’s visits of Sri Lanka in 1971, 1973, 1975 and 1987 with the kind co-operation of several friends who were vitally interested in spiritual enquiry and meditation in its various forms. The task was rendered easy for me, as I had been an active member of the Reception Committee, headed by the late Dr. E.W. Adikaram, that arranged the visits to Sri Lanka of J. Krishnamurti, the world renowned sage and philosopher in the years 1949, 1957 and 1980 which had started revolutionising the thinking of the youth at that time. During Vimalaji’s first visit to SriLanka in 1971, the sadhaka who has now compiled the beautiful symposium called ‘Vimala-Amritam’, was on the threshold of her spiritual journey and was assisting me in preparing extracts of Vimalaji’s earlier talks abroad for distribution to those who came in large numbers to attend Vimalaji’s meditation camps and retreats in Colombo and Kandy. 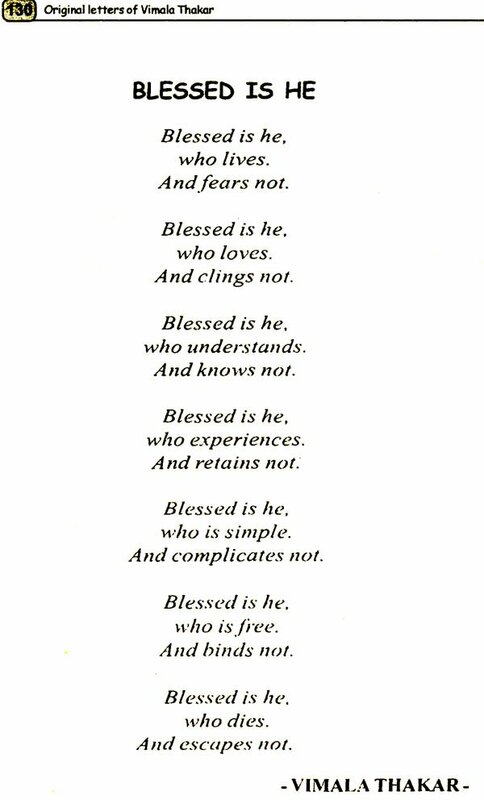 I had the rare good fortune to meet Sri Ramana Maharshi at Thiruvannamalai in India in January 1946 and was doubly blessed to receive a detailed clarification from him about J. Krishnamurti’s teachings on ‘Effortless, Choiceless Awarenss’. Thereafter my close association with Krishnaji and Vimalaji, in the course of organisinig their visits to Sri Lanka, set me firmly on the spiritual quest. I am happy to note that the sadhaka who compiled the book ‘Vimala-Amritam’, has been similarly inspired by the Teachings of Sri Ramana Maharshi, Krishnaji and Vimalaji and has been the recipient of their love and compassion in ample measure. Vimalaji, out of her deep tolerance for human frailties, suggests an initial purification of the sadhaka’s mind by a process of intensive self-education directed towards right thinking and right living, before it is allowed to go into abeyance in the higher states of meditation, where the bliss of silence reigns supreme. Krishnaji expounds the need for ruthless examination and dissection of the desire-oriented mind by observing one’s thought process closely to enable one to go beyond it, on realizing the folly of our ways and the self-destructive nature of our activities. Sri Ramana’s recipe for the absolutely earnest sadhaka is to by pass the ego-consciousness, on realizing its nothingness, and allow the seeking mind to get swallowed ‘alive’ by the Real Self and rejoice in the inevitable surrender of the individualized ego-consciousness to the Universal Cosmic Intelligence. The book written by me entitled ‘An Experiment in Spiritual Inquiry for the Youth’ and published by Bharatiya Vidya Bhavan, Bombay, has significant reference to the valuable teachings of these three eminent Sages, as well as to the messages of a few other self-realized Mahatmas in India and SriLanka. This little book - Vimala-Amirtham came to be compiled by a humble sadhaka as a Love offering to Vimalaji and not as a result of a deliberate plan and effort on the sadhaka’s part to publish such a book. One had the rare opportunity to live with Vimalaji and witness firsthand the purity and authenticity in her thoughts, words and deeds in her daily life. Personally, the seeing of her meditative, rhythmic way of living, gave this sadhaka deep faith in life and trust in one’s own understanding and the courage to live that understanding fearlessly. One felt a deep urge to share with co-pilgrims at least a fraction of what Vimalaji gave this sadhaka in loving abundance for the last thirty years or so. It is being shared with spiritual aspirants on the path who had to cope with similar ups and downs in their lives. this sadhaka had virtually touched the nadir when life’s circumstances had brought her to the point of almost losing her sanity and then Vimalaji made a special trip by air to meet her and face the inevitable buffetings and gently rescue her from the psychic plight into which she had fallen. Thereafter it was a mother’s guidance extended to a rebellious and intransigent child that shaped and helped the sadhaka to arrive at a state of relative peace and harmony and equipoise and later to have glimpses of the ineffable joy and bliss of beholding the Divine in all these names and forms around us. The sadhaka wishes to remain anonymous as far as the general public is concerned, though close associates would be able to recognize and profit from the tender care bestowed on her by Vimalaji as well as the stern reprimands meted out on occasions, to make her stand on her own feet spiritually and be rooted in the Self-as all great Teachers have done down the ages. 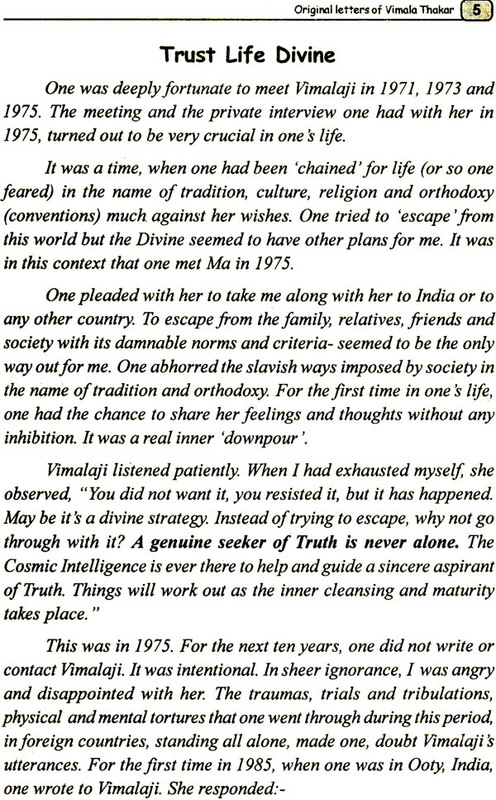 Vimalaji’s letter and other texts have been as far as possible, arranged in chronological order and not subject wise.